The world of Paranormal is one filled with intrigue, suspense and thrill, often mixed with fear, over imagination and paranoia. Indeed, up to 90% of all reported haunting experiences can be explained scientifically in one way or another, be it natural occurances, pyschological processes or simply a creative mind. So what is the most common type of mistaken haunting experience? Well, here in Singapore, people have a tendency to lead quite boring lives. Work can sometimes take up almost 60% of our time, sleep about 30% of our time, leaving just well, 10% of our time for leisure. And if people can still find time to dabble into the paranormal with that little time left for leisure, most often than not, they seek to experience the most out of that limited time left for venturing into the paranormal. Therefore it is not surprising that people create and fine tune their experiences to shape and conclude that they had seen, heard or felt something, just to make the experience worthwhile. Sometimes, we can even matrix our brain such that we can even describe in full detail 'the ghost' we saw, right down to the red eyes glowing at us, and the 'robe' it wore as it 'floated' towards us. So what really is it?? 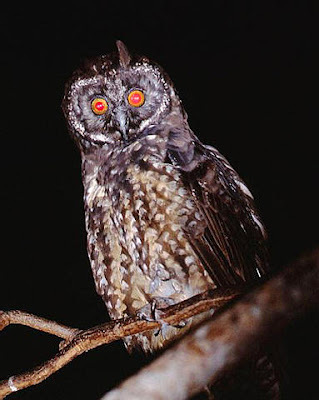 Red eye brown hawk owl, notice its big red glowing eyes, don't they look eerie, especially at night? 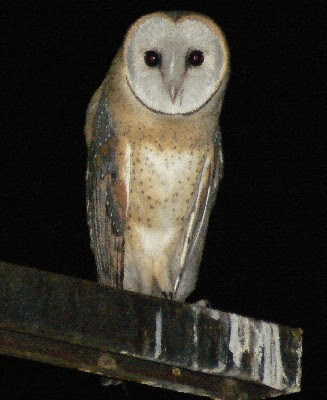 The barn owl, white in colour, often mistaken as a 'Pontianak', commonly found in cemetries. 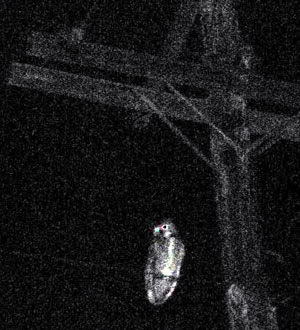 The images above are so easily mistaken for sights of the paranormal, that more often than not, people imagine they have witnessed a ghost rather than rationalize that it was probably just an owl. I mean, afterall, don't we prefer to say that we have seen a ghost, rather an an animal? 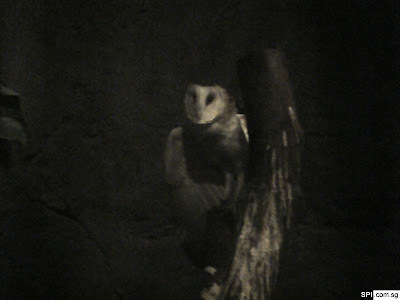 Other images like those above taken at night, clearly illustrates how likely these majestic owls can sometimes be mistaken as ghost on trees....so my fellow paranormal friends, if you are a serious paranormal explorer, lets concentrate more on trying to find true blue paranormal prove, and not delude ourselves psychologically or allow ourselves to think that all paranormal experiences are true. Because the satisfaction of capturing something real goes so much beyond bluffing ourselves and others that we really had a ghostly experience. Ghost Club SG Night Investigation 1!